She depicts herself as facing an extreme, uphill battle, and she probably has that right. The Democratic Party in her state has had some poor luck lately, sort of like neighboring state Wisconsin has had, and she has no political experience yet. But the only way you get political experience is by running, and maybe she will pave the way as the first of us to make it to Congress? 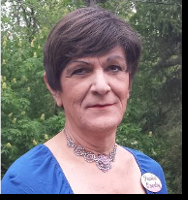 Paula Overby, Eagan, could be state’s first transgender congressional candidate | ABC Newspapers. This entry was posted in Activism, Politics and tagged minnesota, political candidate on August 13, 2013 by . As for the smile: That’s a rather interesting story. If you follow this campaign you will be hearing more about that. Wow Paula, thank you for posting. You have nothing but my most fervent hopes that you win. But I stand by my original comment; you should smile more in the photo ops. My criticism was simply that in this age of baby-kissing, glad-handing, and flag-waving, the average voter is fixated on the visual. You’re a transgender woman standing proud and with the forefront of the movement. You deserve to be happy!